In the days before the Internet, people would need to call the washing machine repair company to schedule a service call. Sometimes the phone would be busy, and other times there would be so many people calling in for appointments that the customer would have to wait on hold for a long time before getting an appointment scheduled. These days, in-home repair organizations need to utilize an online scheduling program to help customers get the help they need. Not only is an online scheduling program convenient for the client, but it can also help the service company out as well. When a customer has his major appliance or computer break down, he wonders what is going wrong with his product. When the refrigerator breaks down at 1:00AM, there isn’t always someone at the repair shop to answer the phone and make an appointment. An online scheduling program will allow the customer to feel better knowing that he was able to make an appointment for a technician to come out the next morning, and the schedule program can also point the customer towards the company’s online reference library. With the reference library, the company can give customers advice on how to handle the situation until the technician arrives. The website can also give general advice on how to troubleshoot issues and give customers an idea of what could be wrong. An online scheduling program can give customers a series of questions to answer that will help the company to determine which kind of tech to send out to the appointment. This will ensure that the right tech is sent out for the job and will help to improve the company’s customer service offering. When technicians get appointments from a telephone call, they are not always supplied with enough information to determine what kind of parts they should take with them. When you use an online appointment making program for your in-house service business, you can give customers a short list of questions to answer that will let the technician know what parts to bring. When technicians get information in a consistent and organized fashion, then they are better equipped to handle customer issues. An in-house service company wants to make sure that the technicians are doing a good job. An online appointment program can send out follow up emails after appointments are over to find out if there is anything the company can do to make the customer experience better. Visit http://www.timepicks.com to learn how to provide the best customer service for your business with online scheduling programs. The Internet has become one of the most powerful marketing tools in history, but it still has a mystique that small business owners have a hard time with. When the Internet was first taking off, it became the way that people all over the world could use to stay in touch with each other and sell products. Because of its international reach, small businesses had a hard time envisioning the Internet as a mode of local marketing. That mystique is slowly going away and the local element of Internet search marketing is something your company should take advantage of. Search for the best pricing in the local area on specific products. Using local terminology to find products they are familiar with. Find new businesses to supply products or services. Get information on new products and services. When was the last time that you used the local phone book to look up a vendor or local business? The chances are very good that you do much of your phone number and business searching on the Internet because it is fast and efficient. If you are using the Internet to find business information, then so is your local customer base. One of the great advantages local search marketing gives a business is the ability to utilize local terminology to quickly reach local customers. For example, a sandwich shop that is located in an area where submarine sandwiches are referred to as hoagies would be able to get his website seen in local search results ahead of shops that do not utilize that local terminology. When you use the Internet to market your business to local customers, you can speak the same language your customers do to get better results. Local search marketing can also be enhanced by the contact you have with your clients every day. If you are a retail sales business and you have been told by a large number of your clients about a popular new product that your competition is selling, then you can bring in that product and then create a local search marketing campaign to announce the new product in your store. That kind of speed and market exposure is almost impossible with a newspaper or any other kind of marketing vehicle. That is why every business needs to become proficient at utilizing the Internet to expand its local customer base. See how http://www.timepicks.com can increase your business. Your local customers are looking up information for their next purchase online just like your customers all over the country are doing. Smart small business owners are utilizing local Internet marketing to increase foot traffic into their locations and expand revenue. When you are developing a local Internet marketing campaign, there are a few things you need to keep in mind that can be used to your advantage. Every region has its own way of communicating. In New York State, some people call soft drinks “soda” while others refer to it as “pop.” The significance of this is that people searching the Internet for local businesses will use the local lingo out of habit. If someone who uses the word “pop” searches for soft drink suppliers online, then the companies using the word “soda” will not show up in the search results. Use the local lingo to your advantage and get your company to show up before the national companies in local search engine results. If you travel the country, then you know that people in different regions give driving directions in different ways. Some people give very specific directions, while others tend to use generalities and landmarks. As with local lingo, the ability to properly guide your customers to your business using the local way of giving directions is critical. When you speak in a language that your target audience understands, then you will be able to attract more people for your business. When you live and work in an area, you become familiar with what is important to the people you are marketing to. For example, a national office supply chain may try to use low prices on printer ink cartridges to attract more local clients, but you know that your local customers care more about inexpensive paper. When it comes to pricing, you need to use every advantage you have to get people to pay attention to your business. If you are marketing your company on the Internet, you know what the local consumers are looking for with pricing and special promotions. That is information you can use to your advantage. Local businesses that team up and develop local Internet marketing content together can often cover more ground than companies working on their own. For example, if a stereo store and a CD retailer work together to create an effective blog, then they are covering more of that market and will see an increase in relevant results. Find local complimentary businesses to develop an Internet marketing program with to enhance your sales results. Visit http://www.timepicks.com to learn more about ways to help your business. The Internet allows for a lot of different conveniences that businesses never had before. One of the tools businesses use on the Internet is online scheduling. But as intuitive and Internet programs can be, there are still mistakes people make when using online scheduling software that can be avoided. You can import email lists and create master distribution lists for your online scheduling software, but you still have to tell the program who gets your notifications. Always remember to create a list of notifications that need to be sent out with each scheduling event you create so that the proper people know the event is happening. The good online scheduling software allows for easy and convenient RSVP notifications from each of the invited guests. This helps you to plan your meeting better and it also helps you to get meeting materials to the people that will be attending. The mistake is that too many business people forget to enable RVPS or forget to gather RSVPs as they come in. Utilize RSVPs to run a more organized event. Online scheduling software becomes even more powerful when you sync it up with your smartphone or your tablet. The problem is that many business people forget to ask about apps for their mobile computing devices that will help them to see their schedule wherever they go. Never assume that Internet access on your smartphone means you will be able to see your schedule. Download the app and make sure you stay in touch with your schedule in real time. Your online scheduling software can do so much more than just schedule your important events. It can also help you to build a comprehensive contact list for all of your business associates, help you to group your contacts into manageable groups and allow you to send out messages intended for specific parts of your contact list. When you sign up for online scheduling software, take the time to review all of its features. One of the biggest mistakes people make with online scheduling software is they forget to schedule all of their important personal events on it as well. In order to be able to service your customers properly and maintain your personal life, you will need to have one schedule that helps you balance the two. Online scheduling software allows you to keep track of all of those important meetings and events, regardless as to whether they are personal or business. Learn how to use online scheduling at http://www.timepicks.com. Online scheduling is a service that your small business can use to help enhance the hard work you are doing to increase revenue. Look for a scheduling service that offers a variety of sharing and online features to help you get the most from your online scheduling. There are several ways that businesses can utilize online scheduling to help improve customer awareness and to increase business efficiency. A good online scheduling service will allow you add as many people as you would like to your calendar updates, and you will also be able to segment your lists and send out specific calendar updates to groups of recipients. You can offer customers the option of signing up for calendar updates that announce new product releases or feature upgrades to current products. This will help you to increase the initial sales of new products and give customers the feeling that they are in your company’s inner circle. A busy small business owner can find himself with a full calendar of events and meetings that can sometimes get confusing. An online calendar is available at all times and allows the small business owner to track his appointments and set meeting reminders that he can get on his tablet or smartphone. Prior to having an online scheduling program, a small business owner had to be at his desk in front of his computer to get reminded about an appointment. With Internet access across a variety of mobile platforms, he can now see his appointments anytime he wants. Most of your customers, vendors and business partners are already utilizing several tools on the Internet. When a small business owner uses an online scheduling software that connects to popular programs such as Outlook, then he can connect to all of his potential meeting attendees and create more effective meetings. With a good online scheduling program, attendees cannot complain that they did not know when a meeting was happening or did not get the agenda in advance. Online scheduling software can become just as effective at organizing internal company functions as it is at helping the company to stay connected to vendors and customers. A small business is a dynamic place where there is a lot going on. You can get more out of your staff if you are able to schedule effective meetings and know where everyone is at all times. This can also help you to organize activities for staff members who are on the road at trade shows or client presentations. 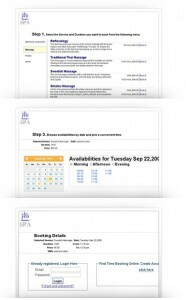 Visit http://www.timepicks.com to see how to make your business a success with online scheduling. Dispel the rumors about alternative medicine and replace them with facts. Interact directly with people who have an interest in alternative health. Link patients with other online resources that will help them to get the information they need. Give your alternative health business credibility by linking it to other respected medical websites. Every alternative health business needs to have a blog to help address the common concerns of potential patients. A blog is where an alternative health professional can post articles that give the truth about alternative medicine and help to counteract the rumors that people hear from unreliable sources. You can also invite people to leave you messages and interact on your blog, which will give you new questions to answer and new ways to help people to understand alternative health. One of the biggest obstacles for any alternative health business is the common misconceptions people have about alternative treatments. A blog can help to give the facts and put the rumors to rest. Another way that alternative health professionals can reach out to prospective patients is through the social media. The Internet is filled with contradicting information about alternative treatments, and a social media presence is a great way to address the concerns of prospective patients one at a time. In the process of addressing each patient’s concerns, you will be answering questions for others that choose not to post their questions on your social media pages. There are many different reputable alternative health publications and organizations online that you can get your company linked to for added credibility. Research the certifications and reputable publications for your alternative health discipline, and get your company involved with these organizations. Not only does it add more credibility to your organization, but it also gives you access to a wider online audience when marketing your company. Networking your alternative health business with reputable companies and getting your company involved in directly answering patients’ questions is critical to your success. You can take full advantage of the interactive nature of the Internet to help expand your customer base and combat the misconceptions that cause some people to avoid utilizing alternative health procedures. Over time, your company can become a valuable online resource for people looking for reliable information on alternative health. Go to http://www.timepicks.com to learn how to increase business flow. An effective online marketing plan will help an online retail business to expand its customer base and help a massage therapist to reach more local clients. The key to marketing your massage therapy business online is to try and find new audiences to target that would benefit from your services. Online content can be crafted to reach just about any kind of audience. Your massage therapy business can utilize the Internet to inspire people to think about massage therapy in new ways. Massage therapy can be very effective when used as part of a regular rehabilitation or pain management program. If you start posting content on the Internet in conjunction with physical therapists, medical specialists and other people that help with pain management, then you can include your business as part of a regular pain management regimen. Once you start to develop patients because of your online marketing efforts with other medical organizations, you will be significantly expanding your target audience. Massage therapy is a popular way for people to relieve stress. The initial massage therapy appointment can seem a bit uncomfortable, but the long-term effects are usually pleasant. As a massage therapist, you should start posting content about the stress relieving capabilities of your business. In this day and age, people are always looking for ways to relieve stress that do not involved medication. You can start a blog that is dedicated to the many ways that massage therapy can reduce stress and enhance people’s lives. When you think about it, there is a large sports-related audience in almost every community. High school athletes and college athletes in your immediate area can be a source of new clients for your massage therapy business. You can start posting articles on your blog about sports rehabilitation through massage therapy using the appropriate keywords. Another way to introduce your massage therapy services to local athletes is through online message boards and social networking. It also helps if you get the athletes that you are currently working with to post something on their social media pages about your massage therapy service. Social networking can be a powerful way to get more people to come to your massage therapy business. You need to start social networking pages and network with your current patients as a way to get started. All it takes is for a few of your patients to post some positive things about your massage therapy business on their social networking pages for the whole thing to take off and bring you more clients. Find out more about marketing your business with online scheduling software at http://www.timepicks.com. The notion that print is dead is accurate in some instances and inaccurate in others. Proactive newspapers and magazines are able to combine their print element with their online presence to create a more comprehensive experience for the reader. But some print publications are finding it difficult to keep pace with their online counterparts. There are some significant advantages to investing in being in an online business directory as opposed to putting your marketing money into a print directory. Buying space in a print directory is expensive, but it is also necessary if you want to offer information that people will need to develop an interest in your company. When you use an online directory, you can include a link to your company website that offers all of the information a consumer could ever need about your company. If you tried to imagine the cost of printing your website in a print directory, then you can begin to appreciate the savings you will realize with an online directory. An online directory offers information on how effective your directory listing is and allows you to make changes to increase your exposure. It is almost impossible to get this kind of valuable instant interaction from a print directory. You can also include a link in your online directory listing that allows consumers to sign up for your mailing list or online newsletter. Once again, that kind of instant interaction is difficult with a print directory. When a print directory is distributed, it is limited by the number of copies that are printed and by the manner in which the directory is put into its target market. A print directory has to go to its target market to be effective, and that can be limiting. An online directory uses search engines to bring the readers to it, which enhances the value of the information found in the directory. When you can have your target audience come to you, then you will be able to get much more effective results. An online directory can instantly change its format to appeal to a wider audience. If consumers indicate that an online directory can be more effective with certain changes, then those changes can be made quickly to expand the audience of the directory. It can take a very long time for a print directory to change its format to try and reach a larger audience. By the time a print directory makes dynamic changes to appeal to a larger audience, that audience may already have new requirements that will affect the ability of the directory to bring in clients. Visit http://www.timepicks.com and get up to date with online directories. Why Should You Choose a Scheduling Program that is Hosted Online? When a company decides to utilize scheduling software, it can choose between software it loads onto its server, or it can use a program hosted by the manufacturer. As you consider the options, remember that there are several advantages to choosing scheduling software that is hosted on the manufacturer’s website. In most cases, the choice becomes a very simple one when you consider all of the options. There is a lot that can go wrong when you load a piece of software on to your company server. The software can conflict with an existing program and potentially corrupt some of your files. The software could have a virus on it which will damage your entire server hard drive. Scheduling programs are large programs that can take up a lot of space on your server that could be used for other programs. When you choose a scheduling program that is hosted by the manufacturer, you do not have to worry about damaging your server and you do not have to worry about finding space to host the program. The manufacturer does everything for you online. A scheduling program is something that your company will use frequently. When a program is accessed frequently, it requires regular maintenance to continue to work properly. When you choose a program that is hosted by the manufacturer, then all of the maintenance falls to the host company. That means that you do not have to worry about scheduling maintenance for your scheduling software, you do not need to worry about paying for and implementing upgrades, and you are not the company responsible for the software when something goes wrong. When your scheduling software is hosted on an Internet portal by the software manufacturer, that means that you can access your calendar from any Internet-enabled computer in the world. You do not need to create an open portal directly to your server, which could expose your server to viruses and attacks from the outside. You can safely access the manufacturer’s secure server through any Internet browser and make any changes to your calendar that you see fit. The best part about choosing scheduling software that is hosted by the manufacturer is that there are always experts watching the program and making sure it is functioning properly. It is as if you had your own personal staff of technicians that is maintaining your scheduling software and making sure that your customers always have the access they need. Go to http://www.timepicks.com and choose your online scheduling program. Online marketing can be a powerful tool for your small business and it can also help you reach millions of potential clients for almost no cost. The trick to online marketing is to develop an organized plan and then stay diligent in your approach. Online marketing requires persistent adding of new content to be effective. Some small businesses avoid putting time into online marketing because they may not understand the return it can bring. If your company is not online, then it does not exist to the more than 90 percent of consumers who use the Internet to find new businesses more than any other search medium, including the phone book. Before you start your online marketing campaign, there are some things a small business owner should know about Internet marketing that will enhance your success. A small business should find the time to maintain a page on each of the social media outlets that will enhance customer exposure. For example, a page on Facebook is a necessity for any business. But a craft business that relies on images of its products to be successful would also do well to have a presence on social networking platforms such as Pinterest as well. Find the right social media outlets for your company and add new content to those outlets every single day. If you want to interact with your clients in a meaningful way, increase your company’s exposure on the major search engines and establish yourself as an expert in your industry, then you need to start a blog. Most small businesses are making blogs part of their main websites as opposed to having stand-alone blogs. To have a successful blog, you must have content that is focused on what your company does and you need to add at least one article per day. You can increase your blog traffic by having guest writers add content every so often. Internet marketing experts are finding that pictures and videos are becoming extremely popular among the people who are looking for new information on the Internet. A customer would rather see a picture of a product or watch a demonstration video than read about the product. There are several video hosting sites that will allow you to post and promote business videos for free. You can choose to have your videos professionally produced, or you can save even more money and make them yourself. As long as the content is entertaining and informative, people will watch and utilize your videos. Visit http://www.timepicks.com for your small business needs.